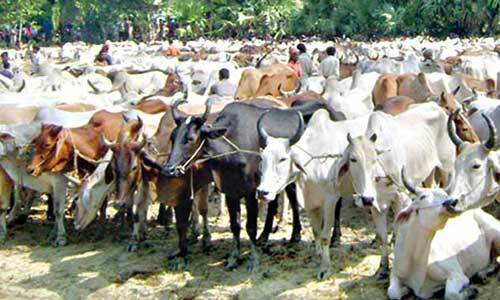 Desk Report: With nearly two weeks left for the holy Eid-ul-Azha, local and Indian cattle have started to arrive in Rajshahi’s cattle markets, reports Observer BD. However, there are more Indian cattle than the domestic cattle though the price of the foreign animals is very high. Visiting the Rajshahi city animal market, it was seen that the Indian cows, Nepali cows are available in the markets. The market people say that the presence of native cow will increase in the last moments of the trading. Cattle trader Sagar said he came to the markets with 20 Indian Andaman Cows, and asking their price Tk 2 lakh and 20 to 25 thousand each weighing about nine to ten maunds beef. He also said that on the first day, 42 Indian Andaman cattle was brought for sale in the city market, 18 in the second haat, 45 in the third, and today (Wednesday), 20 cows have been brought for sale. Some of these have been sold. He hopes the rest of the cows will be sold. City Haat leaseholder Dablu said there are more Indian cows than local cows, and cow is less than buffalo in the market.